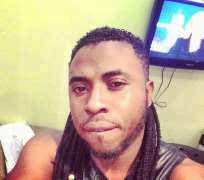 For some days now, talented producer/ singer Samklef has been in the news for controversial issues. The latest one was his obvious rift with Wizkid and how he poured out his mind on the matter. Samklef is back in the news again, but this time, he is in and ready for more tongues to wag. He braided a part of his hair and left the remaining part, this kind of hairstyle have been seen on young guys lately, but the father of one seem to be rocking his style differently. Would you allow your boo rock this hairstyle? Or would you as a guy rock this kind of style.